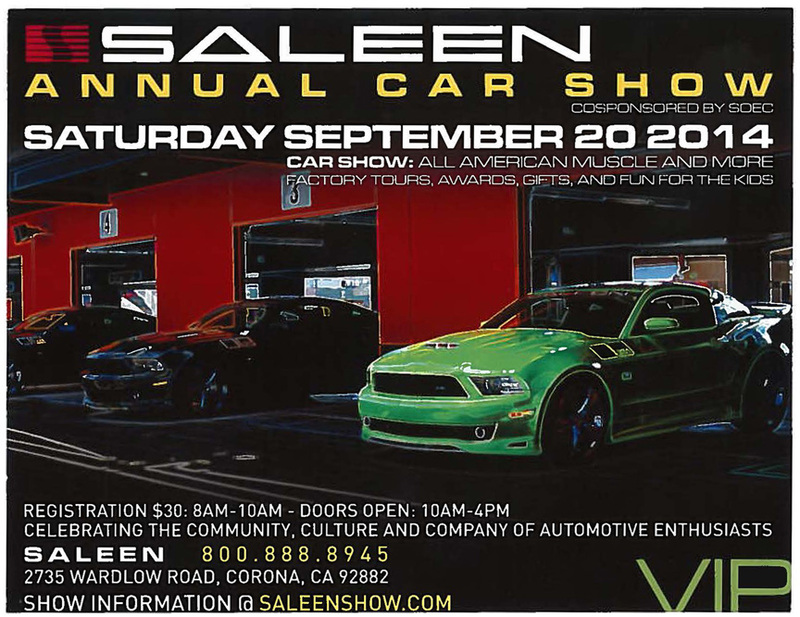 and SOEC present the World's Largest Saleen Show! Join Steve Saleen, the Saleen family and the team at "Saleen Headquarters" as we welcome the Saleen Owners and Enthusiasts Club and all Saleen owners and enthusiasts at Saleen's annual open house and American Muscle car show. This is the world's largest gathering of Saleens and fine examples of American Muscle in the world! Friday evening: SOEC Members, Non-Members and Guests Dinner (casual meet with locals and out-of-towners; pay-your-own way). Meet at Saleen at 5:30 p.m.
More than 30 Saleen and SMS classes! Expanded classes for 2005-09 S-series 3-Valve, Supercharged and Extreme! Also classes for other Mustangs and Fords, plus Chevrolet, Camaro, Dodge and Challenger, and more! Special Display Only category for those who don't want their Saleen judged -- bring your daily driver or fixer-upper! Poster signing and autograph session with Steve! Steve Saleen will autograph Saleen or SMS vehicles after the show -- please be by your vehicle to have it signed. Saturday Evening: SOEC Dinner (members and their guests) -- watch your email for info to come. Sunday: SOEC Breakfast (members and their guests), and out-of-towners who want to attend, Meet at Ayres Suites main lobby at 9:30 a.m. where we'll depart to Godfather's for a hearty pay-your-own breakfast. Comfortable accommodations at a special $79 bargain price, it's only 1.4 miles away on the other side of the 91 freeway and up Frontage Road. Special Saleen rate includes breakfast. All rooms have microwave, fridge and coffeemakers (with coffee) and free wireless. You save $24+ over their regular rate. Double occupancy rooms with double-doubles or a king. Inquire at the time you make reservations for the best room layout that suits your needs. Free parking. Some room for trailers (inquire at desk). There is a do-it-yourself car wash nearby off 6th Street. Call Ayres Suites Corona West directly at (951) 738-9113 and ask for the "Saleen" rate. Room block at that rate is limited, and is good for the full weekend from Thursday-Sunday or as they have room, but you should book by Sept 1. Clarify room amenities and layout at time of booking. Room upgrades available. It's a nice, clean, casual hotel, pool for the kids, and a good mexican restaurant next door. Registration for the show is live -- Please register today! We're looking forward to a great show again this year! And we're Looking for a few good people to help... might need a few Friday night as well as early Saturday morning to help with parking, and off and on throughout the day. Email me, or text or call me at 714-580-3572 with when you may be available and for how long. Send a private message to Jim D.
Find all posts by Jim D.
Back in stock, we have a few copies of The Saleen Book 1984-2003 by Brad Bowling available for pre-sale at a special price. You can pick them up at the show and have it with you while you are in Steve's autograph line and get it signed. Order yours today... we have limited quantities, so email me and I'll send you a PayPal invoice. Are you down for a 'caravan' style roadtrip? I'd like to bring two of my own foxes, and I think a few buddies will be in for the mission as well. Wish I could make it but work schedule is not allow it this year. I'm in. I still need to get my E car signed. Any PJ owners here planning to attend the show Sept. 20th? Anyone wanting to go to the SOEC Dinner, please sign up Saturday morning when you get your registration packet. I noticed they have a non-judged "show" category. I was able to get the weekend off and was going to run over. It's just $30 to register for that? Also question for Jim if your there I don't have my SOEC material or anything yet as I just joined the other week but I assume it's OK to participate in the SOEC dinner and breakfast? Unfortunately, a few things came up and I'm not gonna make it. Posts lots of pics!